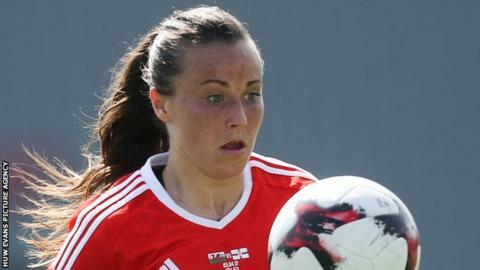 Wales forward Natasha Harding says they can take inspiration from what the men's team have achieved over the past few years, even though they failed to reach the World Cup finals. Chris Coleman's team missed out on qualifying for Russia 2018 after they lost 1-0 against the Republic of Ireland in their final qualifier. "What the boys have done is fantastic," Harding told BBC Sport Wales. "To go down to the wire for a World Cup, they've done everyone proud." Liverpool player Harding added: "If we can take anything from that, it's about how together they are as a group. "They went to places like Serbia and got a point. In previous years they wouldn't have done that. So there's a lot of positives to take from their campaign." Jayne Ludlow's team will play Russia in their second World Cup qualifier next Tuesday, having beaten Kazakhstan in their opening group game last month. Russia on the other hand lost 6-0 against England, even though they qualified for the European Championship in the Netherlands over the summer. "It was a bit of a bad day for them. We haven't really looked at that result because we don't want to go in under false hopes," said Harding. "We've looked at the games they've done well so we can come up against things that might occur during the game." Wales have won four of their last six games, including two friendly wins against Northern Ireland, and a 2-1 win against Portugal. Harding believes they are good enough to get a positive result in St Petersburg. "We're all fully focused on getting at least a point. We genuinely believe we have a chance [of winning]," she added. "We've got a good chance of getting out of this group. Hopefully if we get things right on the day we can get the three points."